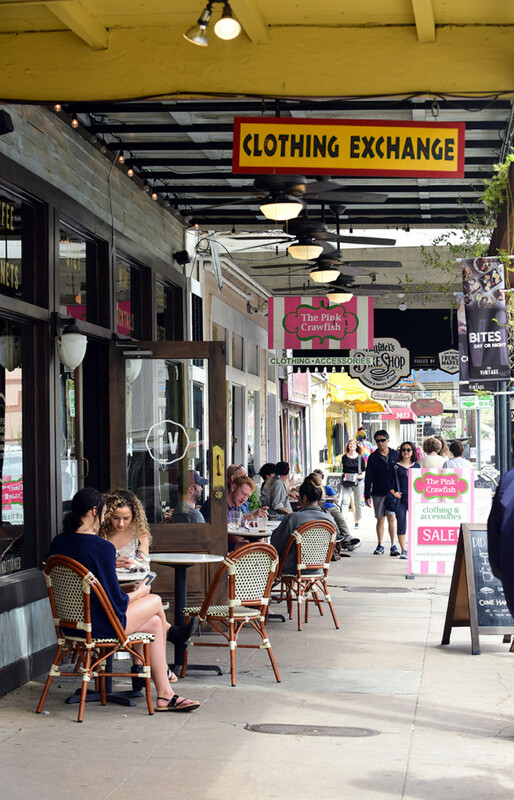 Magazine Street is well known for being a shopping destination, but the thoroughfare also offers a wider variety of experiences that begin near Canal Street and extend all the way to Audubon Park. From school children learning French and arithmetic to older adults catching Mardi Gras throws with their families, the street’s all-ages offerings help make it the vibrant diverse collection of homes, businesses and organizations that hosts locals and visitors throughout the year. Parke McEnery has a unique perspective on Magazine Street as both an occupant of the street and as a real estate broker who has worked with a number of properties along it. Sponsoring Broker at McEnery Residential and The McEnery Company, McEnery knows a lot about how Magazine Street functions as a host to both residential and commercial interests. McEnery Residential is located Uptown at 4901 Magazine St., while The McEnery Company is located just off the Downtown end of Magazine at 810 Union St. The McEnery Company’s appraisal platform has completed nearly 200 commercial appraisal assignments with a Magazine Street address, and its valuation team keeps a close eye on the state of the market along this defining corridor neighborhood. “As the primary commercial corridor in the ‘Sliver by the River,’ Magazine Street is the only aspect of our centuries-old street grid that cohesively and commercially connects the series of distinct neighborhoods that border both sides of the corridor from Canal Street to Audubon Park,” says McEnery. Interestingly, while Magazine serves as the lifeblood of neighborhood commerce, “It is the quality of the residential neighborhoods that abut both the river and lake sides of Magazine, from its genesis to terminus, that will continue to preserve the viability of this unique and treasured street-scape,” he says. McEnery advises potential Magazine Street buyers – commercial or residential – to not just understand the building of interest, but to take a close look at the immediately surrounding blocks and the forces that drive value in the area, considerations such as zoning, parking and building uses/occupancies. Neighborhoods along Magazine Street include the CBD, Warehouse/Arts District, Lower Garden District and Garden District. Each offers its own style and flare, with businesses and organizations to support the lifestyles of nearby residents. For more than 200 years, Poydras Home has served as a Magazine Street residence, first as an orphanage and today as a Life Plan Community with independent living, assisted living, nursing care, memory support and an adult day program for older adults. “Poydras Home provides a garden oasis, nestled in the middle of the bustling retail corridor Magazine Street is famous for,” says Robert A. Prehn Ph.D., CEO of Poydras Home. Poydras Home recently celebrated its 200th birthday by adding a new gazebo, patio and koi pond to the portion of the community’s campus closest to the intersection of Magazine Street and Jefferson Avenue. “This enhancement to our spacious grounds allows residents and their families to enjoy the therapeutic tranquility of nature while still being mere steps away from local restaurants and shopping opportunities,” says Prehn. Poydras Home residents get a front-row seat to 15 parades every Mardi Gras, catching prized throws without leaving home. The home enjoys a long relationship with the Krewe of Thoth, whose members treat residents to a pre-parade preview of throws while their royalty toasts Poydras Home’s own Mardi Gras King and Queen. On Thoth Sunday, Poydras Home hosts a family barbecue and parade party. School children have their own unique Magazine Street experience at Ecole Bilingue de la Nouvelle-Orléans, the only private French school in New Orleans accredited by the French Ministry of Education and State of Louisiana. This year, the school is expanding to include a fourth building directly on Magazine Street. “Over the past decade, Ecole Bilingue has grown exponentially in terms of student body, staff and the scale of programs we can offer, making us a pillar both locally and in the international framework of French immersion schools,” says Rose Goodman, Marketing Assistant. The school serves students 18 months old through eighth grade, and offers a rigorous bilingual French-American curriculum. “Parents might feel surprised to learn that, with 310 students, Ecole Bilingue has 32 nationalities represented. So, not only do our students learn a foreign language, but they truly live and breathe in an international, multicultural, open-minded world,” says Goodman. This summer, Ecole Bilingue will offer a French summer camp for children 2 through 12. No prior French knowledge is required at Le camp d’été, where camp activities are infused with French lessons and cultural immersion. Along with its homes and schools, Magazine Street has plenty of entertainment and fun along its blocks. One could easily spend a day walking its length, visiting the various shops, restaurants and galleries, or one could spend a whole day at just one of its occupants. The National WWII Museum is one such locale, with exhibits and programs that could span even two full days of perusing. “We do recognize that every visitor may not be able to dedicate that much time, so we have suggested online itineraries for people who want to visit for a half day, full day or two days,” says Keith Darcey, Public Relations Manager. According to Darcey, must-sees include the newest permanent exhibit, “The Arsenal of Democracy: The Herman and George R. Salute to the Home Front,” in addition to “Road to Tokyo: Pacific Theater Galleries,” “Road to Berlin: European Theater Galleries” and the US Freedom Pavilion: The Boeing Center, which holds seven of the most iconic aircraft used during World War II. This year, the museum commemorates the 75th anniversary of D-Day. As part of the commemoration, the museum has unveiled a special art exhibit examining the life and work of Guy de Montlaur, a French fine-art painter who fought Nazis on several battlegrounds. “In Memory of What I Cannot Say: The Art of Guy de Montlaur” will be on display through October 20. On May 2, the museum will host the “75th Anniversary of D-Day National Electronic Field Trip,” during which classrooms around the world will embark on a virtual transatlantic adventure to discover the lessons and legacies of Operation Overlord. Another place to spend a day, or even a day and night, is Belladonna Day Spa. The spa offers full- and half-day wellness retreats in addition to overnight escapes. “One of our most popular rituals is the ‘Replenish’ full-day experience, which includes a still bath, seaweed wrap, deep tissue massage, sauna, soothing sensitive facial, vitamin C peel and pedicure,” says Bethany Lirette, Brand Ambassador at Belladonna Day Spa. Guests who “Replenish” also get priority access to the spa’s private lounges stocked with amenities, hot tea and champagne or specialty cocktails in addition to catered lunch. Belladonna’s new hydrotherapy garden adjoins The Suites at Belladonna. The four private suites are available to book for overnight escapes and all feature a private sitting area and amenity-filled kitchen. The new hydrotherapy garden features a sun deck, oversized hot tub and men’s and women’s steam rooms. “It’s the perfect spot for an overnight escape or wellness retreat,” says Lirette, who recommends the suites for girls’ getaways, romantic surprises and relaxing staycations. Belladonna also features an intimate nail salon and retail gift boutique. “We’re thrilled to be a regular ritual for our amazing Uptown community,” Lirette says of the spa’s Magazine Street home. Of course one can’t talk about Magazine Street without pointing out its unique shops and restaurants, which cover just about every thing and every cuisine. Art & Eyes is a one-of-kind eyewear boutique in a renovated double featuring large box windows with eye-catching displays. “Eyewear is tiny, so in order to get your attention we do curious windows that will get your attention,” says Owner Starr Hagenbring. In March, Art & Eyes’ windows featured giant 3-foot and 4-foot glittered eyeballs and frames with Caesar announcing, “Beware the eyes that march.” The boutique also shows “clothing that is art” handmade by Hagenbring. In terms of eyewear, Art & Eyes regularly stocks over 1,700 different frames. According to Hagenbring, the store doesn’t carry any Luxottica or made-in-China merchandise. Rather, the store brings in frames that are largely unavailable in the United States. When hunger hits during a day of Magazine Street wandering, world cuisine is your oyster. Peruvian cuisine is the focus at Tito’s Ceviche & Pisco, a Magazine Street café located Uptown. During Lent this month, the restaurant will offer a number of Peruvian-inspired seafood dishes. According to Executive Chef and Owner Juan Lock, favorites on the menu include the Ceviche Criollo (Gulf fish) and Ceviche Nikkei (yellowfin tuna). The Arroz con Mariscos is a popular Peruvian paella, and meat eaters often indulge in the Anticuchos de Res (hangar steak) and the Lomo Saltado (tenderloin tips). The bar at Tito’s is famous for its selection of Pisco, a Peruvian- and Chilean-made brandy. Happy hour runs Monday through Friday, 3-6 p.m., and features a variety of drinks and tapas perfect for satisfying that late afternoon craving between Magazine Street adventures.